French bread caprese pizza is a quick and easy meal that celebrates the coming of summer. These petite pizzas come together in 5 minutes and are ready to eat in just 10 minutes. 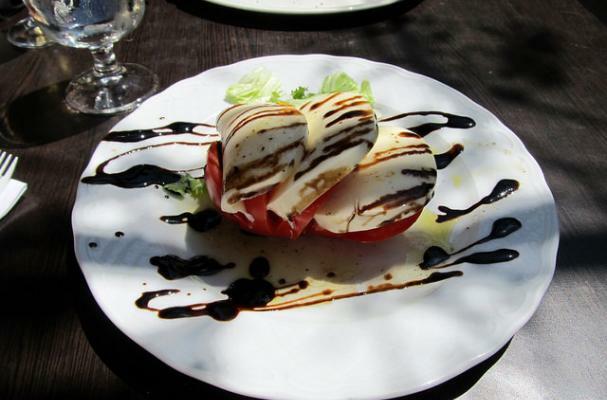 The recipe calls for a balsamic reduction which can be purchased or made. If you decide to prepare your own, simply pour a good quality (but inexpensive) vinegar in a saucepan and cook until thickened. The balsamic reduction can be used in other recipes besides this pizza. I like it drizzled over strawberries with ice cream for dessert. Step 3: Bake the French bread pieces for 10 to 13 minutes or until the bread has toasted and the cheese has slightly melted. Remove from oven and let cool slightly. Step 4: Drizzle the pizzas with the balsamic reduction and top with fresh strands of basil.